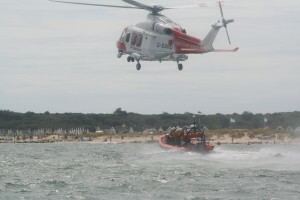 The two adult males on board the 14ft speedboat phoned the coastguard when they realised they were lost and without fuel, lights or lifejackets had no way of getting back to shore. The speedboat had left Christchurch at 7.30pm along with a jetski and were both heading out to Bournemouth Pier. On the return journey the jetskier and jetski became separated from the boat and was found by Southbourne mobile coastguard unit near to Christchurch Quay, where it too had run out of fuel. The crew on board Mudeford Servant towed the speedboat back to Mudeford Quay and the awaiting coastguard team.